Cred is a pluggable authentication system for servers. It allows any number of network protocols to connect and authenticate to a system, and communicate to those aspects of the system which are meaningful to the specific protocol. For example, Twisted's POP3 support passes a username and password set of credentials to get back a mailbox for the specified email account. IMAP does the same, but retrieves a slightly different view of the same mailbox, enabling those features specific to IMAP which are not available in other mail protocols. Cred is designed to allow both the backend implementation of the business logic - called the avatar - and the authentication database - called the credential checker - to be decided during deployment. For example, the same POP3 server should be able to authenticate against the local UNIX password database or an LDAP server without having to know anything about how or where mail is stored. To sketch out how this works - a Realm corresponds to an application domain and is in charge of avatars, which are network-accessible business logic objects. To connect this to an authentication database, a top-level object called a Portal stores a realm, and a number of credential checkers. Something that wishes to log in, such as a Protocol, stores a reference to the portal. Login consists of passing credentials and a request interface (e.g. POP3's IMailbox) to the portal. The portal passes the credentials to the appropriate credential checker, which returns an avatar ID. The ID is passed to the realm, which returns the appropriate avatar. For a Portal that has a realm that creates mailbox objects and a credential checker that checks /etc/passwd, login consists of passing in a username/password and the IMailbox interface to the portal. The portal passes this to the /etc/passwd credential checker, gets back a avatar ID corresponding to an email account, passes that to the realm and gets back a mailbox object for that email account. The logout method has to be called when the avatar is logged out. For POP3 this means when the protocol is disconnected or logged out, etc..
which adds a CredentialChecker to the portal. The optional list of interfaces are interfaces of credentials that the checker is able to check. This is an object implementing ICredentialsChecker which resolves some credentials to an avatar ID. Whether the credentials are stored in an in-memory data structure, an Apache-style htaccess file, a UNIX password database, an SSH key database, or any other form, an implementation of ICredentialsChecker is how this data is connected to cred. A credential checker stipulates some requirements of the credentials it can check by specifying a credentialInterfaces attribute, which is a list of interfaces. Credentials passed to its requestAvatarId method must implement one of those interfaces. For the most part, these things will just check usernames and passwords and produce the username as the result, but hopefully we will be seeing some public-key, challenge-response, and certificate based credential checker mechanisms soon. A credential checker should raise an error if it cannot authenticate the user, and return twisted.cred.checkers.ANONYMOUS for anonymous access. Oddly enough, this represents some credentials that the user presents. Usually this will just be a small static blob of data, but in some cases it will actually be an object connected to a network protocol. For example, a username/password pair is static, but a challenge/response server is an active state-machine that will require several method calls in order to determine a result. Twisted comes with a number of credentials interfaces and implementations in the twisted.cred.credentials module, such as IUsernamePassword and IUsernameHashedPassword. A realm is an interface which connects your universe of business objects to the authentication system. This method will typically be called from 'Portal.login'. The avatarId is the one returned by a CredentialChecker. Note: Note that avatarId must always be a string. In particular, do not use unicode strings. If internationalized support is needed, it is recommended to use UTF-8, and take care of decoding in the realm. The important thing to realize about this method is that if it is being called, the user has already authenticated. Therefore, if possible, the Realm should create a new user if one does not already exist whenever possible. Of course, sometimes this will be impossible without more information, and that is the case that the interfaces argument is for. Since requestAvatar should be called from a Deferred callback, it may return a Deferred or a synchronous result. An avatar is a business logic object for a specific user. For POP3, it's a mailbox, for a first-person-shooter it's the object that interacts with the game, the actor as it were. Avatars are specific to an application, and each avatar represents a single user . As mentioned before, the mind is usually None, so you can skip this bit if you want. Masters of Perspective Broker already know this object as the ill-named client object . There is no mind class, or even interface, but it is an object which serves an important role - any notifications which are to be relayed to an authenticated client are passed through a 'mind'. In addition, it allows passing more information to the realm during login in addition to the avatar ID. The name may seem rather unusual, but considering that a Mind is representative of the entity on the other end of a network connection that is both receiving updates and issuing commands, I believe it is appropriate. Although many protocols will not use this, it serves an important role. It is provided as an argument both to the Portal and to the Realm, although a CredentialChecker should interact with a client program exclusively through a Credentials instance. Unlike the original Perspective Broker client object , a Mind's implementation is most often dictated by the protocol that is connecting rather than the Realm. A Realm which requires a particular interface to issue notifications will need to wrap the Protocol's mind implementation with an adapter in order to get one that conforms to its expected interface - however, Perspective Broker will likely continue to use the model where the client object has a pre-specified remote interface. The protocol implementor should define the interface the avatar should implement, and design the protocol to have a portal attached. 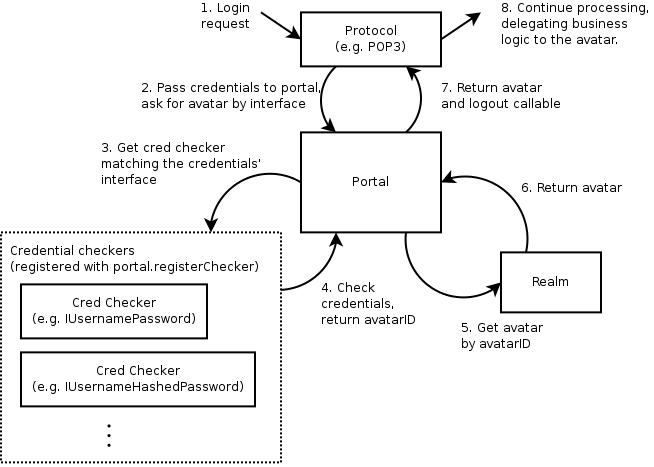 When a user logs in using the protocol, a credential object is created, passed to the portal, and an avatar with the appropriate interface is requested. When the user logs out or the protocol is disconnected, the avatar should be logged out. Cred offers a plugin architecture for authentication methods. The primary API for this architecture is the command-line; the plugins are meant to be specified by the end-user when deploying a TAP (twistd plugin). For more information on writing a twistd plugin and using cred plugins for your application, please refer to the Writing a twistd plugin document. To build a plugin for cred, you should first define an authType, a short one-word string that defines your plugin to the command-line. Once you have this, the convention is to create a file named myapp_plugins.py in the twisted.plugins module path. The core purpose of the CheckerFactory is to translate an argstring, which is passed on the command line, into a suitable set of initialization parameters for a Checker class. In most cases this should be little more than constructing a dictionary or a tuple of arguments, then passing them along to a new checker instance. A checker factory for a specialized (fictional) API. # for the plugin system to find our factory. # This tells AuthOptionsMixin how to find this factory. # your particular cred plugin requires at the command-line. argStringFormat = "A colon-separated key=value list." # when someone uses the "--help-auth-type special" command. authHelp = """Some help text goes here ..."""
# We need to instantiate our class for the plugin to work. For more information on how your plugin can be used in your application (and by other application developers), please see the Writing a twistd plugin document.